Those who follow the San Francisco Giants know the speech given by Hunter Pence, the fiery left fielder who delivered a sermon when the eventual World Champions were down 2 games to none in a best of 5 playoff series to the Cincinnati Reds. Emotional leadership, teamwork, sacrifice, karma, and heart are the words people are using to describe this year’s world champions of baseball.The team is another improbable bunch of players that nobody gave a chance! Nobody gave them a chance when the best hitter in the National League was suspended. Nobody gave them a chance when their bitter rivals made a blockbuster trade to try and beat them. Nobody gave them a chance when then were down 2 games to the Reds. Nobody gave them a chance when they were down 2 games to the Cardinals. Nobody gave them a chance when they were pitted against the Yankee slayers, the fearsome Detroit Tigers with the best pitcher and hitter in baseball. Even the baseball pundits said they had no chanceNobody but the 25 guys in that clubhouse and their 42,000+ fans who packed their stadium every night. Why? Why didn’t anyone believe? Didn’t this team just win the championship just two years before? 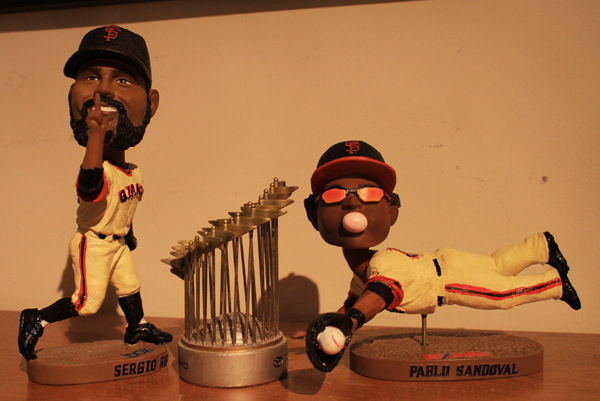 Well gone was the World Series MVP and the NLCS MVP (Renteria and Ross). Also gone was their starting 2nd baseman and their spiritual leader to season ending injuries (Sanchez and Wilson). The first baseman was barely serviceable (Huff) , their 3rd baseman ran off to the rival Dodgers and their young catcher was coming off a serious injury (Posey). Their young catcher was the only everyday player on both teams. So why? How? Many around San Francisco call this the ultimate team. It was unselfish teamwork. They played for each other. And those who believe in the spiritual call it “The Particles”. Like “The Force” in Star Wars, the particles are the energy that surrounds this team. Some people swear they can feel them. Some say they can even taste them and that they are really sweet. This was a team of destiny. Facing 6 potential games of elimination, they hit their stride and fought back with fierce determination with a made for movie script. They say that baseball is a metaphor for life. Well the lesson that this season’s World Champions taught was to never give up. As I wrote back in 2010, that team was a “team of Misfits”. It was a team that represented the frustration of generations of Giants fans who suffered 52 years without a Championship. It was a cleansing. This team represented everyone else. It was so easy to relate to this team. The slogan of 2010 was “There’s Magic Inside”. In 2012 the slogan was “Together We’re Giant” . Everyone felt that they could relate to this team and the Giants made sure to include all of their fans. 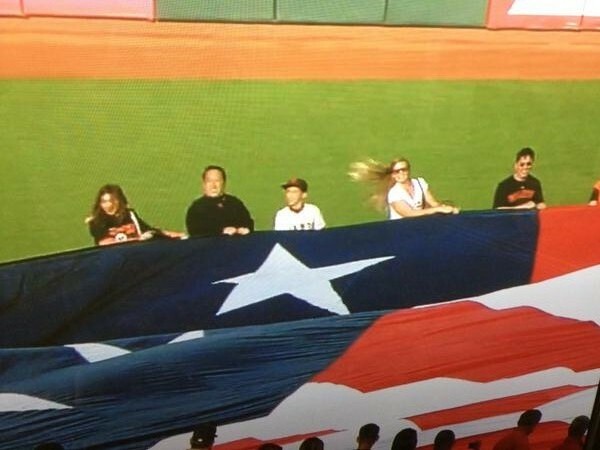 I for one was able to share in the flag carrying ceremony before one of the NLCS games with my son. It was a memory for a lifetime. It didn’t hurt that the Giants were on their way to winning 7 straight games and a second World Series Championship. In that way, I was able to appreciate this for me, and not for my father who suffered through all those years of disappointment. Yes, this was also a team of misfits. But let let me give a few points as to why people can relate to this team. Why this team represents the dreams and desires of the common fan and gives everyone a lesson in redemption. The team was led by two men who were suffering in 2010 that they were basically given bench roles (Zito and Sandoval). They were led by a dimunitive mariachi-inspiring, photo-bombing closer (Romo) at 150 lbs who was the protege of the fire breathing bearded closer in 2010 (Brian Wilson). The were led by a journeyman castoff pitcher who was cut by a couple minor league teams and had gone to Japan to find himself. And they added to their merry band, two hard-working and inspiring veterans (Pence and Scutaro) who reminded them what it means to play for one another and to believe in their ability as a team. Who in their right mind could not relate to that story. This was a blue collar team that nobody gave a chance. This was a team that would never give up. They were the Rocky of baseball. They ran up those proverbial stairs and behind them was a huge wave of Orange fans screaming and shouting! This team never gave up and never quit. They showed the heart that sometimes overcomes the obstacles put before us. In a physical game, this team lacked the 100 mile an hour fastball and the 250 lb monster power hitter, but the team showed us why David beat Goliath and why we love the underdog. 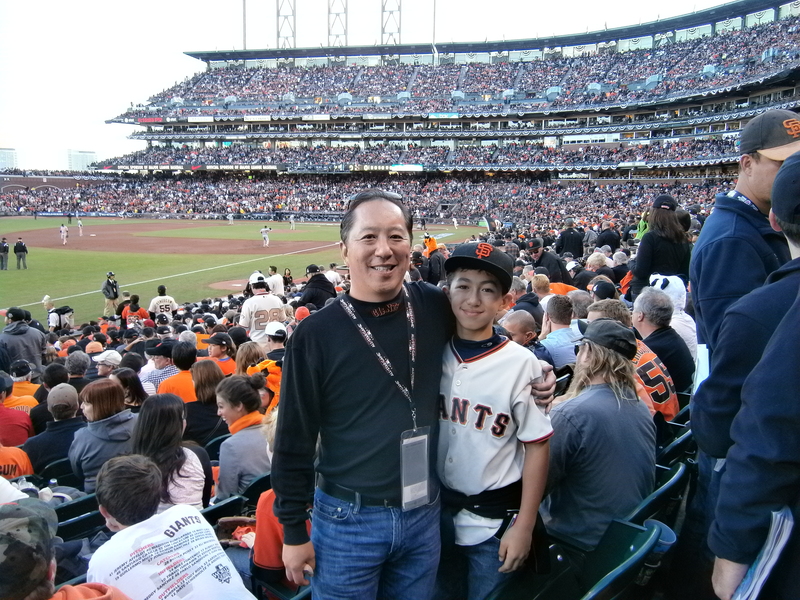 Because we all believe the underdog is us (unless you are in Detroit), whether you are a Giants fan or not, you can’t help but appreciate what the San Francisco Giants accomplished. Thank you Giants for showing us that teamwork does work and that sometimes the underdog does get the meaty bone. Giants fans will savor this one. I know I will savor this one. It isn’t better than the first time. It isn’t sweeter than the first time. We saw in 2011 that it isn’t easy to do it again, and that is why we appreciate an effort that is one for the record books.